Kazimir Severinovich Malevich (23 February 1879 – 15 May 1935) was a painter, art theoretician, pioneer of geometric abstract art and one of the most important members of the Russian avant-garde. He was also the founder of the art movement Suprematism. Malevich, 1912: 'Morning in the Village after Snowstorm', oil on canvas; location ? We have rejected reason because we have found another reason that could be called trans-rational, which has its own law, construction and sense.. .This reason has found a way-Cubism-of expressing the object. ..[to gather] under a new banner.. ..[that the poets of yesterday's Futurism ] change the means of battle with thought, content, and logic.. ..advance Alogism after Futurism. Balla, he advanced Dynamic Futurism.. ..drawing closer, not to the human body but to the machine, as contemporary muscles of a man of today.. .The actual structure of each of Balla's works tells us that the dynamic power sensed by the artist is incomparable greater than the actual bodies of the machines, and the content of each machine is only a small part of this dynamic power, since each machine is a mere unit from the sum total of the forces of contemporary life. I possess only a single bare, frame-less icon [his Squares ] of our times (like a pocket), and it is difficult to struggle. But my happiness in not being like you [ Aleksandr Benois ] will give me the strength to go further and further into the empty wilderness. For it is only there that transformation can take place. And I think you are mistaken when you say in reproaching me that my philosophy will destroy millions of lives. Are you not, all of you, like a roaring blaze that obstructs and prevents any forward movement? I transformed myself in the zero of form and emerged from nothing to creation, that is, to Suprematism, to the new realism in painting – to non-objective creation. It is the experience of the speed of a plane, which was looking for an expression, a form and this caused the plane to come into existence. The plane was not built to take letters from Berlin to Moscow, but to give expression to the irresistible urge to create a form for the experience of speed. Only when the habit of one's consciousness to see in paintings bits of nature, Madonna's and shameless nudes.. ..has disappeared, shall we see a pure painting composition. I have transformed myself into the nullity of forms and pulled myself out of the circle of things, out of the circle-horizon in which the artist and forms of nature are locked. I have broken the blue boundary of color limits, come out into the white, besides me comrade-pilots swim in this infinity. I have established the semaphore of Suprematism. I have beaten the lining of the colored sky, torn it away and in the sack that formed itself, I have put color and knotted it. Swim! The free white sea lies before you. Man's skull represents the same infinity for the movement of conceptions. It is equal to the universe, for in it is contained all that sees in it. Likewise the sun and whole starry sky of comets and the sun pass in it and shine and move as in nature.. .Is not the whole universe that strange skull in which meteors, suns, comets and planets rush endlessly? I paint energy, not the soul. I recommend [the students] that you should work actively at the Hermitage and study the artistic structures of Rubens, Rembrandt, Titian, Watteau, Poussin, and other painters, even Chardin, where he is an artist. Study very closely their dabbing manner of execution and try to copy a small piece of canvas, just one square inch. By Suprematism I mean the supremacy of pure feeling in creative art. To the Suprematist the visual phenomena of the objective world are, in themselves, meaningless; the significant thing is feeling. 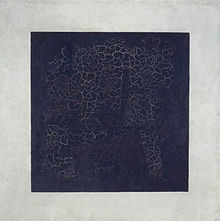 When, in the year 1913, in my desperate attempt to free art from the ballast of objectivity, I took refuge in the square form and exhibited a picture which consisted of nothing more than a black square on a white field. The critics and, along with them, the public sighed, 'Everything which we loved was lost. We are in a desert.. .Before us is nothing but a black square on a white background!' But the desert is filled with the spirit of non-objective feeling.. ..which penetrates everything. By Suprematism, I mean the supremacy of pure feeling in the pictorial arts. From the Suprematist point of view, the appearances of natural objects are in themselves meaningless; the essential thing is feeling – in itself and completely independent of the context in which it has been evoked. Academic naturalism, the naturalism of the impressionists, of Cézannism, of Cubism, etc., are all so to speak nothing but dialectic methods, which in themselves in no way determine the true value of the work of art. The representation of an object, in itself (the objectivity as the aim of the representation), is something that has nothing to do with art, although the use of representation in a work of art does not rule out the possibility of its being of a high artistic order. For the Suprematist, therefore, the proper means is the one that provides the fullest expression of pure feeling and ignores the habitually accepted object. The object in itself is meaningless to him; and the ideas of the conscious mind are worthless. Feeling is the decisive factor.. ..and thus art arrives at non-objective representation – at Suprematism. Tatlin does not transcend the confines of Cubism. I too was filled with a sort of shyness and fear, as I was called to leave 'the world of will and idea' in which I had lived and created, and in whose reality I had believed. But the happy liberating touch of non-objectivity drew me out into the 'desert' where only feeling is real.. ..and so feeling became the content of my life. It was no 'empty square' I had exhibited but the feeling of non-objectivity. I perceived that the 'thing' and the 'idea' were taken to be equivalents of feeling, and understood the lie of the world of will and idea. Is the milk bottle the symbol of milk? Suprematism is the rediscovery of that pure art which in the course of time, and by an accretion of 'things', had been lost to sight. The principal element of Suprematism in painting, as in architecture, is its liberation from all social or materialist tendencies. Through Suprematism, art comes into its pure and unpolluted form. It has acknowledged the decisive fact of the nonobjective character of sensibility. It is no longer concerned with illusion. Painting has turned back from the non-objective way to the object, and the development of painting has returned to the figurative part of the way that had led to the destruction of the object. But on the way back, painting came across a new object that the proletarian revolution had brought to the fore and which had to be given form, which means that it had to be raised to the level of a work of art.. .I am utterly convinced that if you keep to the way of Constructivism, where you are now firmly stuck, which raises not one artistic issue except for pure utilitarianism and in theater simple agitation, which may be one hundred percent consistent ideologically but is completely castrated as regards artistic problems, and forfeits half its value.. .If you go on as you are.. ..then Stanislavski will emerge as the winner in the theater and the old forms will survive. And as to architecture, if the architects do not produce artistic architecture, the Greco-Roman style of Zyeltovski will prevail, together with the Repin style in painting.. Without a doubt, this [Malevich' painting Black Square ] is the 'icon' which the [Russian] Futurists propose as a replacement for the Madonnas and shameless Venuses [besstyzhie venery]; it is that 'dominion' [gospodstvo] of forms over nature.. ..[in Malevich's system, at the base of which lies a] horrific means of mechanical 'renewal' [mekhanicheskoe 'vosstanovlenie'] with its machinishness. [This] is not a chance little episode that occurred on the Field of Mars; it is one of the acts of self-affirmation the source of which has as its name the abomination of desolation. It [Malevich' Suprematist paintings] asserts itself through arrogance, haughtiness, and by trampling over all that is dear and tender; it will lead only to death. Long live Unovis - the path to a Suprematist future - and long live Kazimir Malevich, the true guide along this path! For us [the young artists in Vitebsk, 1920] Suprematism did not signify the recognition of an absolute form which was part of an already completed universal system, on the contrary; here stood revealed for the first time in all its purity the clear sign and plan for a definite new world never before experienced - a world which issues forth from our inner being and which is only now in the first stages of its formation, for this reason the square [Malevich's] Black and Red Square ] of suprematism became a beacon. This is the model we await from Kasimir Malevich. AFTER THE OLD TESTAMENT THERE CAME THE NEW AFTER THE NEW THE COMMUNIST AND AFTER THE COMMUNIST THERE FOLLOWS FINALLY THE TESTAMENT OF SUPREMATISM. In this text 'Suprematism in World Reconstruction' Suprematism is postponed by El Lissitsky in a far wider concept than Malevich meant. At present there is an extremely exaggerated formation of groups [students on the 'School of Art' in Vitebsk, founded by Chagall around 'trend'; there are 1. young people following Malevich and 2. young people following me. We both belong to the left-wing artistic movement, although we have different ideas about ends and means. Typical for the difference between both art movements [Russian Suprematism & Constructivism (art) ] is that Malevich wrote a book entitled 'Gegenstandlose Welt' [World without objects / things]. Whilst El Lissitsky specifically mentioned Gegenstand (object!) in the magazine he published with w:Ilya Ehrenburg. The Suprematists want, where possible, to give 'feelings' absolute supremacy. Even objects such as tables, chairs and beds are, according to Malevich, 'not objects but the form of plastic perceptions'.. .'The experience of sitting, standing or walking are, in the first place plastic experiences'. From the beginning of the [Sovjet] Revolution I was a member of the Committee for Art.. .Later I worked at 'Izo Narkomprosa'. From 1919 I taught at the Higher Artists' Workshops in Vitebsk [the 'Vitebsk Higher Institute of Art', where El Lissitsky and Kazimir Malevich were invited to teach art by the director then Marc Chagall ] (our students Suetin, Judin and others). White was for Malevich the color of infinity, and signified a realm of higher feeling.. ..an utopian world of pure form, attainable only through nonobjective art. Indeed, he named his theory of art Suprematism to signify 'the supremacy of pure feeling or perception in the pictorial arts'; and pure perception demanded that a picture's forms 'have nothing in common with nature.' Malevich imagined Suprematism as a universal language that would free viewers from the material world. In political terms, a question remains: what did it mean that Malevich turned again to depictions of peasant life at precisely the time of the forced collectivization of agriculture and the 'liquidation of the kulaks as a class', as Stalinist rhetoric chillingly has it? Whatever the answer to this question, a recently published letter of April 8, 1932, from Malevich to Vsevolod Meierhold makes clear that for him the return to figuration was not a break with the Revolution but a way of safeguarding it and preventing the return [in painting art] of Classicism and Naturalism. Malevich, with his strikingly developed social instinct, once again attempted to outdo everyone upon his release from jail (after having been arrested in Kiev in 1930). In an ordinary composition of colored stripes he included a row of galloping cavalrymen. You want a 'Soviet' picture - here, take it! Many artists, incidentally, made similar gestures during these years when the "Soviet theme: painting" was affirmed as the basis of Soviet art. Malevich did not gain much by such a strategy and he resorted to it extremely rarely. It didn't help at all. One of his students still has a letter to Malevich (it arrived one day after his death) notifying him that his request for a pension had been turned down. In one of his letters from Vitebsk to David Shterenberg in Moscow - a letter written in 1921, when the organization of the Erste russische Kunstausstellung (First Russian Art Exhibition, Berlin, 1922) was only beginning to be discussed - Malevich took pains to emphasize that he was an ideological worker in art. And that the Berlin exhibition would be of interest to him only if his "icons" - the Black Square, Chernyi krug (Black Circle), and Chernyi krest (Black Cross) - were exhibited. And exhibited only, moreover, under the rubric 'Suprematizm Rossiia'. 1913 (Suprematism: Russia, 1913). Nineteen thirteen?. ..Malevich, who was a genius at hypnosis, convinced not only everyone else but even himself that he had inaugurated Suprematism in 1913 - and not in any other year. His account of his own career is full of datings of works according not to the year in which they were produced but the year in which they were conceived. This page was last edited on 4 August 2018, at 12:58.